This competition is limited to entrants who live within a 50 km radius of Warrnambool, Victoria, Australia. It’s Spring. Like our happy pets for the chance to win six months flea protection for your pet! on the Warrnambool Veterinary Facebook page. Entrants names will be randomly drawn. The competition will run for a period of 10 weeks with the first prize draw on Wednesday 16 September with a further 7 weekly draws from that date. 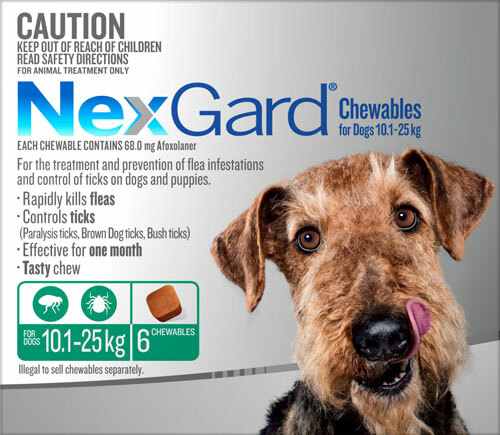 Winners will receive one 6 Pack of NexGuard Chewables for Dogs in a size to suit the weight of their dog. Winners will be notified via a Facebook post on Warrnambool Veterinary Facebook page and will need to contact Warrnambool Veterinary on 03 5561 2255 to claim their prize. By entering and participating, the entrant agrees to hold harmless, defend and indemnify Facebook from and against any and all claims, demands, liability, damages or causes of action (however named or described), losses, costs or expenses, with respect to or arising out of or related to (i) entrant’s participation in 6 month Flea control competition, acceptance of a Prize and/or use or misuse of a Prize (including, without limitation, any property loss, damage, personal injury or death caused to any person(s).